Engagement. Conversation. Influence. Transparency. Trust. 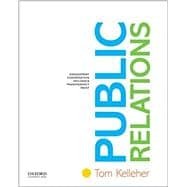 Public Relations presents a clear, engaging and contemporary picture of public relations principles while seamlessly integrating technical and cultural shifts brought about by the rise of social media. Both its professional relevance and digital savvy make Public Relations the new standard for introductory public relations courses. Tom Kelleher is Professor and Chair of the Department of Advertising at the University of Florida. Kelleher has published in many scholarly journals including Public Relations Review, Journal of Public Relations Research, and Journal of Communication. Case Study: "Tweeting Under False Circumstances"
Case Study: Edward Bernays' "Torches Of Freedom"
Ethics: Safeguarding Confidences--Who Owns Your Social Networks? Case Study: Ceo Versus New Hire. Who Wins? Appendix C: The "IPRA Code of Conduct"